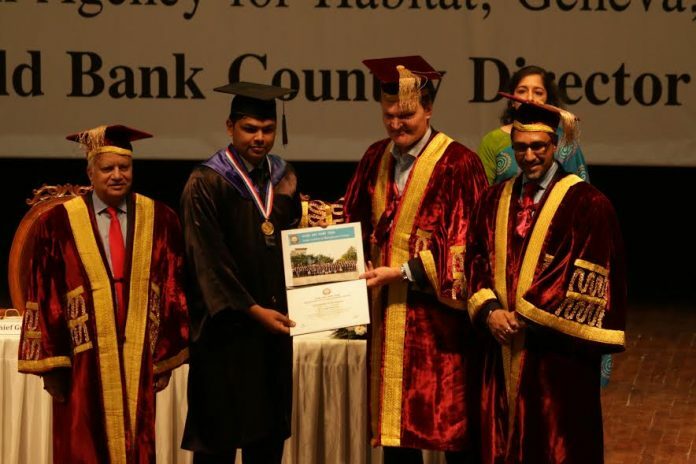 Rohtak: Indian Institute of Management Rohtak conducted the 6th convocation ceremony on Saturday, 18th March, 2017. 156 students of the 6th batch of Post Graduate Programme in Management graduated in the presence of proud parents, friends and relatives. Speaking of his days at the World Bank, Mr. Rühl said, “I spent 23 years there (at the World Bank) and I saw Eastern Europe catch up with the European Union, I saw Africa move from being called ‘the Hopeless Continent’ to being one of the hottest emerging markets, I saw poverty rates worldwide go down”. “In my last assignment, I saw India become the fastest growing economy in the world,” added Mr. Rühl, who was also the former World Bank country director for India. He presented gold medals to two students. Shubham Aggarwal was conferred with a scholastic achievement award, while Rahul Varshney bagged the all-around performance award. He congratulated the outgoing batch for the remarkable placements. “IIM Rohtak’s final placements for the graduating batch of 2017 saw an increase in the average CTC by 10%, according to the interim report published by the institute. The highest CTC offered was Rs. 25.9 LPA. This is remarkable given the stage of our institute vis-a-vis other established IIMs and other management institutes in India. 25 students were offered PPO/PPIs based on their performance in their summer internship. Of them, 20 students accepted the offers in companies such as Idea Cellular, Dabur, ICICI, etc. Our placement report is transparent and is audited by an independent agency, as per the Indian Placement Reporting Standards”, added Dr. Sharma. Chairman of the Board of Governors, Mr. Ravi Kant proudly announced, “The Institute has been selected by the ministry of HRD and the ministry of Science and Technology as a technical business incubator”. Elegantly dressed in their convocation gowns, the students of the outgoing batch could be seen reminiscing their time spent at the institute and discussing their future aspirations. They bid farewell, for one last time, to their alma-mater, while promising to contribute in their capacity as alumni, for the institution’s journey towards excellence and building global leaders.